The Yorkshire Canary - also known as the "Gentleman of the Fancy" - was developed in the mid-1800s in Bradford, England, and was first shown in Yorkshire, hence its name. The development of the Yorkshire included crossbreeding among the norwich, lancashire and belgian bult canaries. The Yorkshire Canary has the greatest length of all canary varieties available today. Its target length is 6.75 inches and this canary has been bred to have a a large chest and shoulders, a narrow waist, and a rigid, erect stance, which should be at an angle that looks like a clock's two hands at five past seven. Yorkshire breeding takes a little more effort than other canaries. The care of this canary is the same as for other canary species, except for the size of the cage. As they are large canaries, additional space needs to be provided to them. 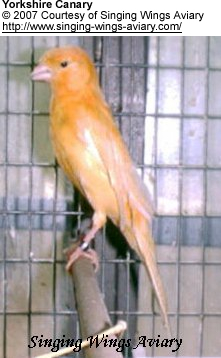 Should you consider purchasing a canary, please contact the Singing Wings Aviary -- http://www.singing-wings-aviary.com - breeder and connoisseur of this and other canary breeds.